My kids have been Phineas and Ferb fans forever! My husband and I actually enjoy Phineas and Ferb as well because it's a cartoon that shows creativity and imagination, two things that we both feel are very important especially for children. It's also full of fun and adventure! I have to laugh at Candace every time we watch Phineas and Ferb because she's always trying to get her brother's into trouble and she always fails. How many of us can relate to a sibling like Candace? Last night we watched the premiere of Phineas and Ferb: Across the 2nd Dimension. The movie was great and everyone really enjoyed it. During the entire movie it was so quiet, except for the laughter! 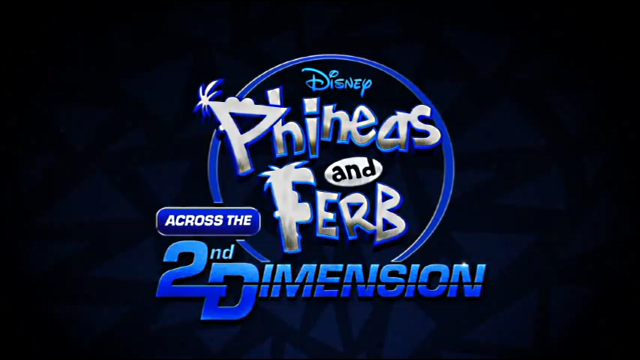 Whether you're already a fan of Phineas and Ferb or have never watched them before, Across the 2nd Dimension is a must see movie! It's full of action, great music, adventure and laughter! From young to old it's a movie the entire family will love. Phineas and Ferb is the hit animated Emmy Award-winning series, which follows two stepbrothers, Phineas Flynn and Ferb Fletcher, who set out to conquer boredom and make every day of their 104-day summer vacation count. However their older sister, Candace, gets frantic at her brothers' extraordinary adventures and makes it her life's work to tattle on them to Mom and Dad…but somehow she's never quite able to prove what the boys have done. Phineas and Ferb are accompanied by their pet platypus, Perry, who seems to be a docile, mindless family pet, but unbeknownst to everyone, including Phineas and Ferb, Perry has a secret life as suave Agent P, deftly battling the evil Dr. Doofenshmirtz to save the world. In this animated adventure -- based on Disney Channel's Emmy Award-winning comedy series "Phineas and Ferb" -- stepbrothers Phineas and Ferb go on their biggest journey yet, into another dimension! When the boys finally discover that their beloved pet platypus Perry is in fact a secret agent who battles the forces of evil daily, they join him on a grand adventure that blasts them to another dimension where a truly evil Dr. Doofenshmirtz has taken over an alternate Tri-state Area. When they uncover his ploy to travel back to their dimension to take over their Tri-state Area, the gang, as well as their alter-egos, must band together to stop him. **I was selected by Child's Play Party to host the first ever Disney Channel Movie Screening Party of Phineas and Ferb Across the 2nd Dimension. I received a fun party pack in exchange for my review and honest opinion. Regardless, I only recommend products or services I use personally and/or believe will be a good fit for my readers. The views and opinions expressed on this blog are purely my own. Results may vary. I was not compensated in any other way for this review. A great big THANK YOU to Child's Play Party and Disney Channel! My kids watched it, and when it was done my five-year old son started bawling! He was completely unstoppable, and I could not figure out why. When I finally got him to calm down enough so that I could understand him, he told me that the movie made him soooooo sad. ....then he started crying again:) I have never seen anything like it.